I haven't given myself one of those fashion inspired gift wrap challenges lately and since I am nursing a muscle injury from when we swerved and averted a car accident a few weekends ago I have to stay off the bike and am self-restricted to minor movement. I can stand and wrap, just can't seem to bend well so a wrapping challenge it is and this fashion photo had me more than intrigued. Nothing like a good dose of coral fur to distract me from the fact that my cycle challenge is interrupted so early in the game. Too bad, the weather is simply fabulous right now and I could have covered some ground by now. This is only a delay and not a quit kind of excuse before I even start. And I think I want that doggie in the window, I am having replacement dog fever really bad these days. I used to put a ribbon on my male puppy until my son said "no more Mom" and he was right, the poor boy dog looked ridiculous. The next dog will definitely be a female. She can watch me gift wrap with ribbons in her hair. What a luscious coral colour to experiment with and turn my head towards a colour zone that I might not think of by myself. Fashion has a way of doing that for me. 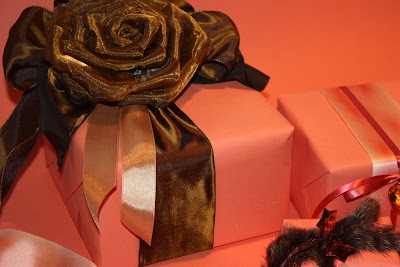 I notice combinations that served me well in my designer days and now gift wrapping. 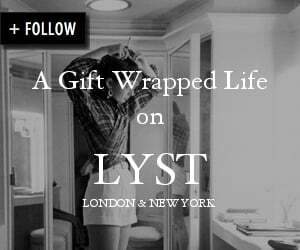 Looking for gift wrap cues in fashion and interior design isn't such a frivolous thing, inspiration comes by keeping your eyes and creativity open. I have these gorgeous bronze organza bows that I gussied up with a length of bronze taffeta so the ribbon bows would add volume to the rear of the organza bow. It doesn't really need it, I just like doing it. I find myself reaching for these narrow, satin ribbons lately. For something so thin, it does seem to capture the eye which surprises me. I tend towards wide ribbon in much the same way I tend towards larger jewelry, nothing more than a personal preference. In the end I did slide a wider hand-dyed silk underneath so it just goes to show you how I can't shake my preferences as easily as I think. I like to move bows forward to the front of the box just to mix up the styles. And you know how I love these glass hearts. Since my photo table moved I have been having a bit of a camera lighting and focus problem. This really is the same coral as the top photo. Time to call in the real experts again. Yes, this really is mink ribbon and I had very little of it left to work with so I gussied it up with an organza ribbon that has petite glass stars. Just gave it a little more sparkle and gift glam and how much better could the star colour be for this wrap challenge? This mink ribbon is so unique and tactile that it does show it's luxurious nature best on solid paper, it certainly doesn't need any pattern competition. until this muscle is healed? Practise my sultry look. 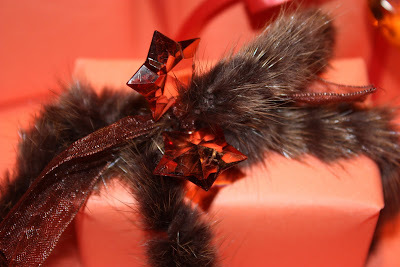 These organza bows do have plenty of impact for gift wrapping and cost no more than a standard ribbon bow. That being said, isn't this a better way? I have them in bronze, chocolate brown, black, and green and they are on my website under the Wrap Room. Just so you know. 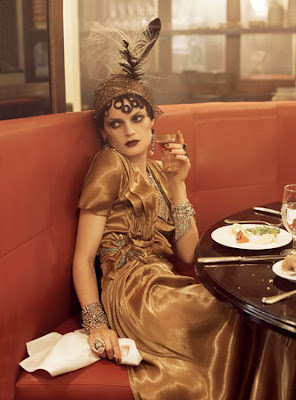 A frou frou welcome to the most fashionable of new followers. Packaging is everything... and these are gorgeous! I love how you put the bow on the side! Genius!! Oh I love coral with brown! And you reminded me of this coral top I used to have. For the longest time, whenever I wore it, people would comment that I looked great - It was such a plain top, I couldn't figure it out - until I realized it was the color giving my face a little extra oomph! Hmmm ... where IS that top? Nobody does coral like you! I believe this means Beautiful spring is almost here! Oh and that mink, A M A Z I N G!!! 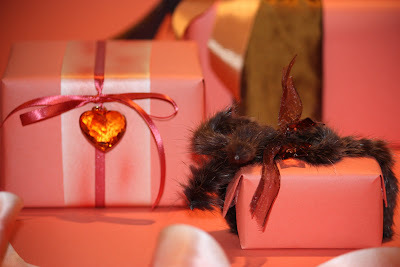 Mink ribbon and coral wrapping... a definite winner in my book!!! Lovely color combination. Mink ribbon; how lucious. First of all, these are so chic! Secondly, I want to be the woman in the first image and wear that outfit!!! That mink is DIVINE ! By what I have seen on the runways .... fur is back in a big way ! Coral is such a beautiful colour and brown goes with it perfectly, Sande. I love the little glass hearts. They really give the gift that special twinkle. Rest that ankle well, and you will be back on your bike before you know it. 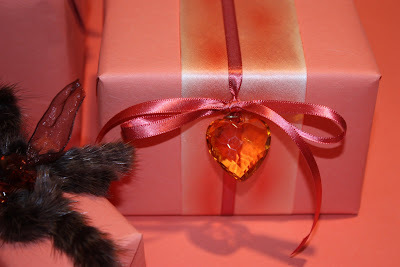 J'adore the heart on the box... BEAUTIFUL! sorry to hear about your injuries. Get better soon. LOVE this post. Love the thought of your dog is bows too. Lovely colors and textures, Sandi! 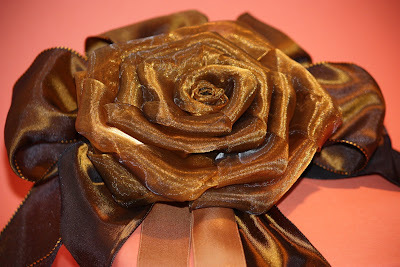 That mink ribbon is divine - wow!